I’m currently busy preparing for my painting workshop in Copenhagen but I’ve also started a new painting project. I decided some time ago that once the Megaboss was finished I would like to paint a bust. Just as the Megaboss project was in it’s final stages I was contacted by Piotrek (Peter) Czajka. 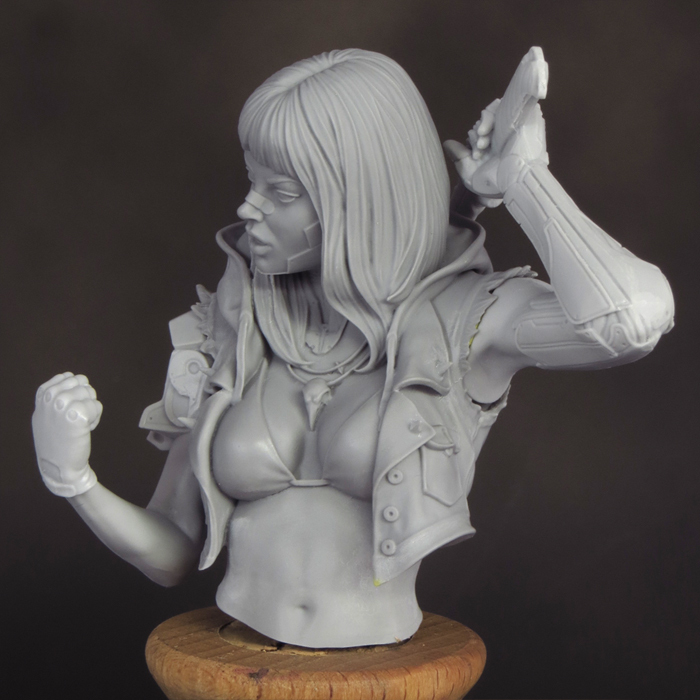 Peter is the man behind Neko Galaxy and he asked me if I would be interested in having a copy of his C- Girl Akito bust to paint. I’d seen, and been most impressed by, the stunning version of this bust painted by Krzysztof Kobalczyk. Now this is a lovely bust but I had to think carefully before accepting, as it’s not the type of subject I would have normally considered painting. Then it struck me that that was exactly why I should paint it! It’s time to step out of my comfort zone and push myself by painting a new type of subject. When the bust arrived it was just as good in reality as it looked on screen. 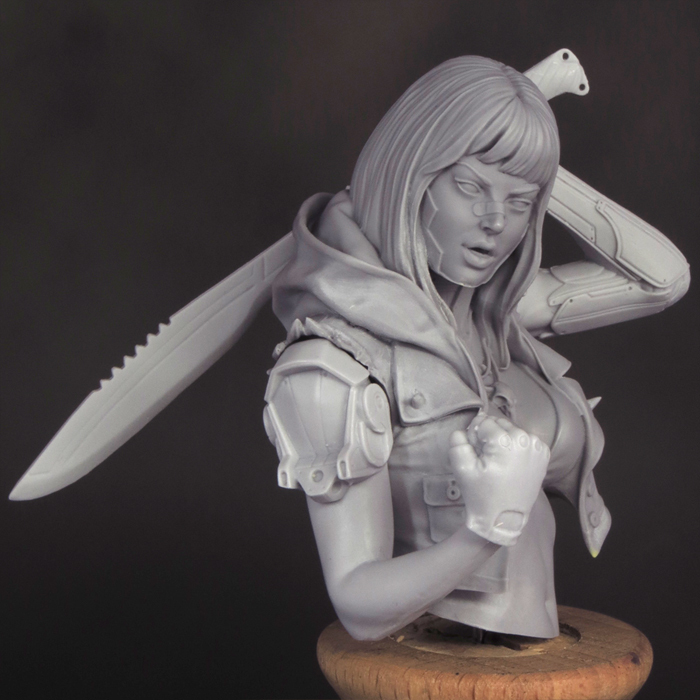 I’m still something of a newbie with regards to resin busts, so I was very glad that the clean-up was very straight forward with only a few slight mould lines to clean up. I’ll confess that I was daunted by the prospect of painting a young human female as I’m far more used to taking on the monstrous likes of Nurgle. 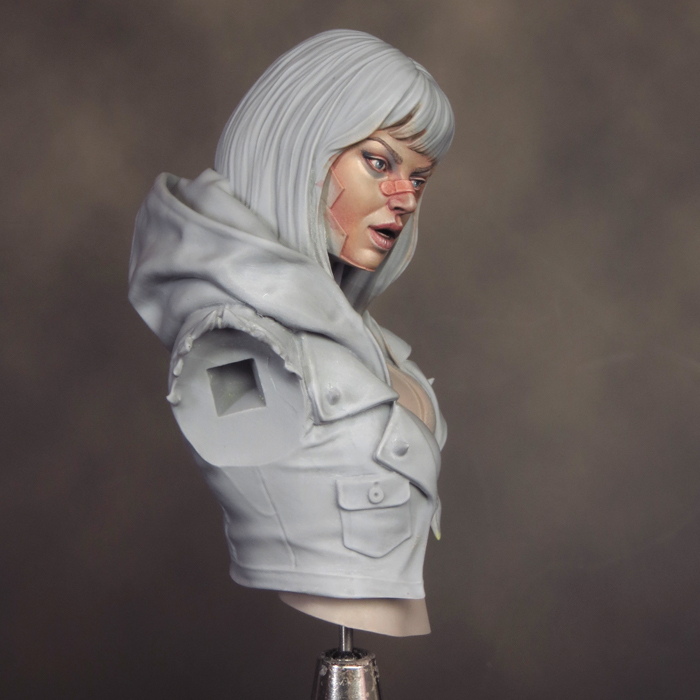 However I sat myself down, took a good long look at the bust, and began to figure out how I wanted to paint her. I quickly realized that this bust offers tremendous opportunities for painting contrasting textures and I fully intend to make the most of that. I’ve decided to paint Akito’s costume as dark leather to contrast against the flesh tones. 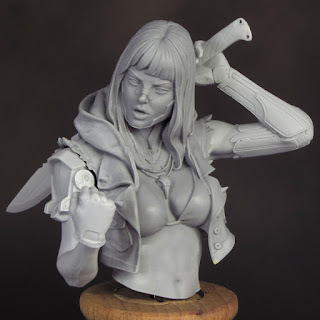 I’ll use true metallics, as with my previous busts, because I prefer them to NMM when I’m working in this scale. I want to give Akito a bit of a punky feel so I’m taking inspiration from the current fashion for bright multi-colored hair which will provide an ‘interesting’ painting challenge. I’m sure my plans will evolve as the project progresses but, with my planning done, it was time to dive in and get painting. As is usual for me, I decided to start with the face. 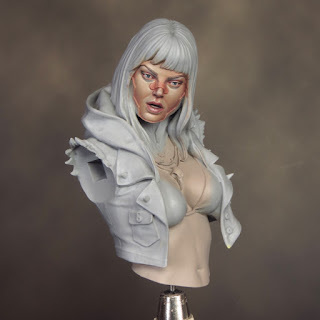 The flesh tones seemed to be the most logical starting point on this bust and, as the focal point of the piece, the face would set up the personality of the piece. I’ve said it before but if you can’t get the face right, it doesn’t matter how well the rest of the piece is painted it will all look ‘off’! I wasn’t initially sure how to go about painting a youthful human flesh tone but quickly realized that my method of painting monster flesh would do the job. Starting off with a base of GW’s Rakrth Flesh I carefully built up glazed layers of my various flesh tones. Applying the color this way makes use of the translucent qualities of diluted acrylics. This helps to give the flesh tones a luminous quality and, hopefully, a life-like appearance. I’m very happy with how things are going so far and I’m surprised at how much I’ve achieved (for me) in just one day’s painting. This project is proving to be exactly the challenge I needed and I’m feeling pretty excited about it’s potential! Going to follow this one closely, Dave. Looking awesome already! Did you prime first or start with base colours straight on to the resin? Hi Mark, I'm painting my base colours straight onto the resin. 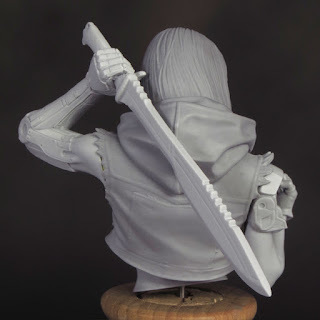 cool, i love resin miniatures, but i cant find any busts in my town, or online for a reasonable price. What is this?! A non-GW model on the workbench? Well, so far and so very good! The skin tone is flawless, keep up the fine work! !